The Canning Doctor: "I Like Your Hobby Because it's Useful." He's right, though. Of all the hobbies and crafts I've done over the years, this one is the most adapted for gift giving. And eating. Everyone likes to eat, right? There's always jam and soup and other yummy foods in the house. And they are in conveniently sized containers such that, when we have a need for a quick gift, voila, we have something at our fingertips. 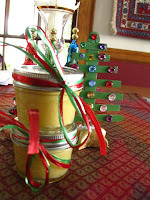 On Christmas eve we will load the 17 jars for our neighbors into the wagon and go strolling about the neighborhood, spreading good cheer and citrus curd along our way. Happy holidays to all! I've been busily wrapping jars of yummy stuff all afternoon. The baskets look so pretty. It's certainly useful to be warm in my lovely sweater... but the canning creates little units of gratitude that are better sized to actual life. You can't just hand someone the sweater off your back in quite the same way you can pop a jar out of the pantry as way to say "hey thanks!"